As summer progresses, gaps will inevitably start to appear in your garden as plants are harvested. It’s a bad idea to leave those gaps as the bare ground will attract weeds and be prone to erosion during summer storms. But you don't need to leave gaps at all, even if you have plans for fall crops later on. With plenty of heat and long days in summer, some plants require very little time to go from sowing to harvest time. Read on to find out which super-speedy vegetables will give you a harvest in just a few short weeks – just the job for the impatient among us! Radishes are one of the fastest vegetables, taking just three to four weeks to reach harvest time. They’re also exceptionally easy to grow. 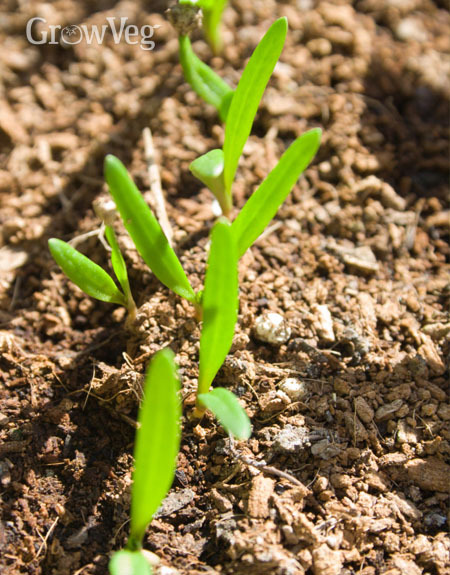 Seeds can be sown into prepared ground or pots of potting soil. Sow the plump seeds very thinly, spacing them about one inch (2.5cm) apart. Sowing small batches every few weeks until the very end of summer will give you a continuous crop of the peppery roots. The seedlings will pop up within three to five days. If necessary, thin the seedlings so the roots have enough room to expand. Keep the ground free of weeds, and water in dry weather. Harvest the roots before they get too large, when they can turn woody in texture and become overpoweringly hot. Ever-versatile salads present a symphony of leaf shapes, textures and tastes ideal for livening up meal times. 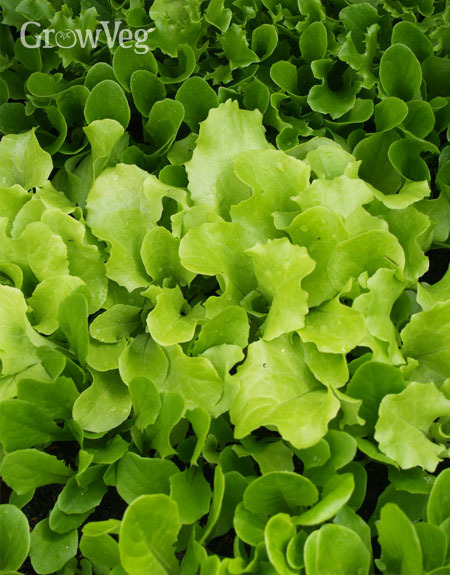 Grow individual varieties or create your own salad blend by mixing two or more varieties together before sowing. Suitable salads include lettuce, mustards and other Oriental leaves, kale, and rocket. For the quickest results, sow a mix of salads sold for repeat, or cut-and-come-again harvesting. Sow the seeds very thinly into drills spaced around 6-10 inches, or 15 to 25cm apart. Cover the seeds back over then gently pat the surface of the soil down. Water along the rows then keep the soil moist and weed free as the seedlings grow. If summers are very hot in your area, you may need to wait a few weeks or use shade-cloth to reduce temperatures for germination and good growth. Harvesting can start just three weeks after sowing. Take two or three outside leaves from each plant at any one time. This allows the remaining leaves to grow on and provide another cut in a few days’ time. Cut little and often for best results. The quickest pods in town, dwarf beans, can be sown immediately after a previous crop to give a speedy picking before the end of the current growing season. Taking just two months from sowing to pod production, these trouble-free beans are a must – and kids love them! In summer the beans can be sown directly into the ground or into pots of potting soil. Poke the seeds into the soil so they are 10-16in (25-40cm) apart. Sow a batch once a month until the end of summer. The short, bushy plants will soon come into flower. Pick the pods every few days, as they appear, so that you are always enjoying them while they are still smaller and more tender. Regular picking encourages plants to continue forming pods. Savour the beans lightly steamed with a curl of butter and a grind of the peppermill. Carrots are not the most obvious speedy vegetable, but choose a quick-growing finger-sized variety and you can expect sweet, crunchy roots in just six weeks. Sow into pots of potting soil, spreading the seed thinly over the surface, then cover with a thin sieved layer of compost. Or sow the seed into drills spaced about 6in (15cm) apart, cover back over, and water. In some parts of the world, the larvae of the carrot fly can prove a nuisance, burrowing into the roots and spoiling the crop. A row cover will keep the flies from laying their eggs. Once the seedlings have appeared, thin them on a rainy day when there will be fewer carrot flies about, or on a still, cloudy day to about an inch (2.5cm) apart. Water afterwards to settle soil back around the roots. 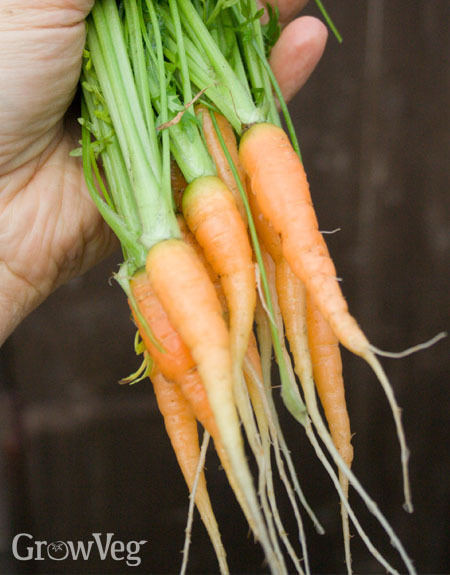 Pull up the tender carrots while they are still young, if necessary using a border fork to first loosen the soil. The smooth, succulent leaves of spinach are extraordinarily versatile. Use them in salads, as a key ingredient to quiches and flans, or stirred into risottos or pasta dishes. Start it off once a month to enjoy right up until the first frosts. Sow into rows about a foot (30cm) apart. Set the seeds an inch (2.5cm) apart then thin the resulting seedlings to roughly 8in (20cm) apart. Plants can quickly bolt in hot weather, which causes the leaves to turn bitter. Prevent this by sowing in light shade during the heat of summer and by always keeping the ground moist. Cut the leaves away using a sharp knife or scissors. Don’t let the leaves get too big, and remember to harvest little and often. Later sowings can be covered with a row cover or tunnel to help growth along as the weather turns cooler. Sow your super-speedy crops into well-prepared soil. This simply means ensuring the soil has enough nutrients to support healthy growth and has the right texture to encourage even germination. In most cases all that’s needed to prepare the ground is to sprinkle on a top-up of organic fertiliser before raking the soil surface to a fine tilth. All of these super-speedy vegetables can also be grown in pots of good-quality, multipurpose compost. While our quintet of super-speedy vegetables will have little time to attract pests, do take a few precautions. Carrot fly has already had a special mention. Use the same row covers protecting your carrots to guard against flea beetles on radishes and some salad leaves. Slugs can decimate seedlings, so set up beer traps or shady retreats such as an upturned grapefruit shell, then collect up and discard any slugs you find. It’s perfectly plausible to sneak in some super-speedy vegetables even up until surprisingly late in the summer. Try some of these quick croppers and get ready for a bonus harvest in next to no time. We’d love to hear what other super-speedy vegetables you recommend for your area, so why not drop us a comment below and tell us.